On Saturday we had tickets to see Bush play in Norwich, so we had booked a hotel in Thetford for the Friday night, with the aim of going to some National Trust places on Saturday before heading up to Norwich for the evening. Handily the Premier Inn in Thetford is just under a mile from the start of Thetford parkrun, so my decision was made! After a slight google maps based hiccup (telling me to turn left into London road when the street sign said Norwich road) I arrived at the meeting point (in the drizzle). At first only a few people were milling about but I think they were all waiting for the last possible moment to get out of their cars and brave the rain! Clockwise from top left- the jelly baby corner, one of the bridges, the car park meeting place, and the sign for the town. There was a new runner briefing and they even had a big A2 laminated map of the course- it looks pretty complicated but in reality it was well-marshaled and I didn’t go wrong once! We did a slightly altered route due to travellers camping on part of the normal route. We walked a little way to the start from the meeting point, and then it was a bit like the shape of clover (3 leaves meeting in the middle) as there were 3 sections of the course, and you ran each section twice before moving on to the next section, with a little bit added on to take you to the finish area. I was pondering this as I ran- I was lapped during my first lap of the second section, but other than that I didn’t see any front runners. I think I went past the tail walker on my second lap of the second part, but it was never too congested. As it was a town centre park, I didn’t know what to expect, but it was really pretty. The route went through parks filled with trees, and alongside a river. At one point someone warned me of a hill at the end, but in reality it was a slope leading up to a bridge- it had a marshal dressed as the Honey Monster (I think – he had a big yellow fluffy head..) cheering everyone up the hill. On my second lap of the loop I tried to take a photo while I was running but I took it too early so when I looked at them later you couldn’t really see him. At a couple of points the course narrowed (middle bottom photo) as you had to pass through metal gate things, but everyone was very courteous and friendly and as it wasn’t a really busy one it wasn’t an issue. I briefly stopped once as I was not sure whether I needed to repeat a section, but the marshals were great at saying “if you’ve only run over the bridge once, repeat this loop” to all of the runners so I realised as I slowed that I needed to go around again. It was a super flat course, and it turned out that I managed my fastest parkrun time since May (28.22) with a nice negative split too- always nice to manage a final mile beginning with an 8. The marshals were brilliant- I feel like I say this about all of the parkruns (doing a Brucie- “you’re my favourites”) but they were honestly just fantastic. There seemed to be lots of them too- I think maybe the nature of the course meant that you passed the same people a few times, and also the timekeepers and RD could be in the middle seeing the runners, so you passed a bit more of a crowd at times. The honey monster marshal was brilliant, they have a jelly baby corner (I’d seen a plea on their facebook page for a top up as it was running low) and this week it was manned by a lady and her daughter, and then at one point there were maybe three marshals all in a row singing “if you’re happy and you know it give us a wave” and various versions of the song. I passed them twice and they didn’t let up once- very enthusiastic! When I finished, I then realised that the barcode scanning was taking place back at the little car park where everyone had first met. I think it was because of the rain (possibly they didn’t want to move all of the kit)- this did seem like risky business and I was very paranoid on the little walk back that I would lose my token! After being scanned (and being told very helpfully by the person my token number in case I hadn’t read it) I had a little wander around the priory to admire the stone ruins, before heading back to the hotel. It turned out that a lot of the route was near the road that I ran along, so I could take a few photos (for example, of the jelly baby marshals) while I was heading back. I am so glad that I visited! Have you ever lost a finish token? I live in fear of dropping it or throwing it in a bin with a tissue by mistake or something! So this week there was no yoga as the hall was already booked. I had mentioned to Andy that we could go to the cinema as we have not been in a while, but there was nothing worth seeing on Wednesday. As I was still getting over my cold, and Logan Lucky was showing on Tuesday, I decided to skip the Tuesday club run, and run on Wednesday (normal yoga day) instead, meaning we could have a night out in the week. The cinema we went to has a Starbucks in the foyer (although they don’t take the reward card which was annoying as I have a free drink to use up)- we shared a hot chocolate as it was pretty chilly. The film was good fun too. Although we got home a bit late it was nice to relax in the cinema and not have the option of any work (as I have been doing a fair bit in front of the TV in the evenings recently). 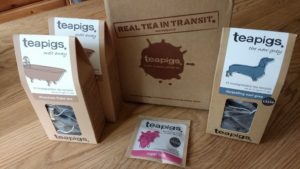 Teapigs had a free delivery offer so I had stocked up on the chocolate flake tea- it’s my favourite to have at the weekend for breakfast, and even though you can get other Teapigs flavours (types?) in Waitrose or on Ocado, they don’t stock the chocolate flake ones any more. 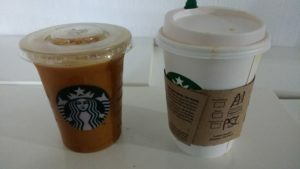 (I know technically it is a drink but that would have been a much longer blog post title). I was wandering around the shops the other weekend and saw first up this ready made bircher muesli (basically, the Swiss invented overnight oats years ago and now it’s trendy because of instagram or something)- I tend to have a sort of version of it in the summer where I soak chia seeds and nuts, muesli (usually the Dorset “normal” one) and some fruit overnight with almond milk, and then add a little peanut butter on top in the mornings. 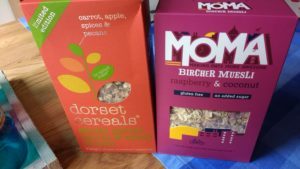 When I saw the Moma stuff on offer I thought it would be lovely (and it is)- with freeze dried raspberries and big slices of coconut. I also saw this limited edition (they saw me coming) “gently spiced apple and carrot muesli” I knew I had to give it a try (it has cinnamon and nutmeg- mmmmm), although I am being sensible and only having one on the go at once. 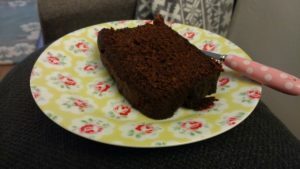 I also made a ginger cake- it was meant to be with treacle but I only had molasses- more iron in it now anyway (as it was blackstrap). So tasty. I went for a short run on Wednesday (and remembered half way through I needed to get some salad for dinner, so ran around to the shop), and then on Thursday it was raining so I did a fairly short route. I felt OK though- I think the fresh air is now helping to clear the airways. We are off to Norfolk on Saturday so hopefully I’ll be doing some more parkrun tourism! Have a lovely weekend all! What have you seen in the cinema recently? Are you getting ready for more autumnal flavours now? I’m already well into this week but thinking back to last week – on Tuesday I had a run with the club- I hadn’t been for ages due to the summer holidays and various other reasons, so it was great to run together. We made the most of the fading light (we meet at 6.30 pm so it is getting dark by the time we finish now) and headed to the lakes for a final run of the year before it’s out of bounds. Yoga on Wednesday was fab- it’s always different (and I have no idea what type of yoga it is) with a focus – last week we looked at using binds to hold poses for a big longer and in a deeper way. As always, much needed. On Thursday I felt a bit under the weather- nothing specific but really shattered. 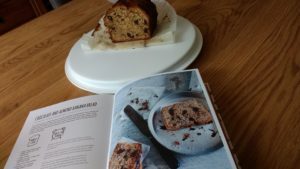 I had planned a run, but I got home much later and decided that I would walk around to the shops and pick up a few bits, and then after a shower and dinner, bake some banana bread. This was followed by some TV watching. After finishing Narco’s we have started to watch a true crime series on BBC called Storyville- Death on the Staircase. It is following the trial of a man being accused of murdering his partner- he says he found her at the bottom of the stairs. (Also, I feel like I heard a Criminal episode about this and basically it was an owl attack, so no spoilers because I don’t know if it is the same, but I am calling it!). On Friday after work I was meeting a friend at The Waffle House- we are both teachers and always plan in trips at the start of the term as we know we will need the sugar boost! 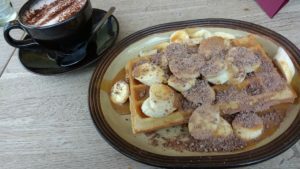 I’d already had too many cups of tea that day so I opted for a hot chocolate and the banoffee waffle- so delicious. After getting back from parkrun on Saturday I felt a cold coming on- we did get some more fresh air but I felt wiped out so after going to look at the log storage at the fire shop I basically lounged on the sofa (this is not like me). 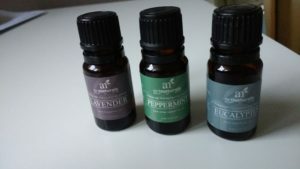 I’ve been using a combination of oils to help de-congest (peppermint, eucalyptus and lavender) in my diffuser and on a tissue in my pocket. 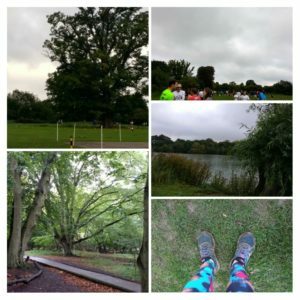 On Sunday I decided a run would not be a good idea- I probably would have been fine but my next race is a 10 miler in October so I have a while, and I didn’t want to go back to work feeling more tired. We walked the very long way into town (4 miles), bought a curtain pole and visited Andy’s parents. 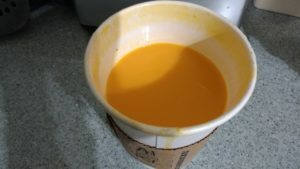 It literally (yes) looks like tomato soup. Hmm. It was OK but not as nice as a chai latte- we both agreed that we were glad we had tried them, but we are also glad I didn’t pay full price for them! Again I went on a walk after dinner to get some fresh air. I’ve been a fan of them for ages- in the UK they used to only do three flavours (peanut butter, oatmeal raisin and chocolate chip) in smaller bars- I’d get them in the health food shop in town or order them from Wiggle. I’d always stock up if we went to the US and as you can get them more easily now I often have one before a race if we are away for the weekend and I can’t make toast. 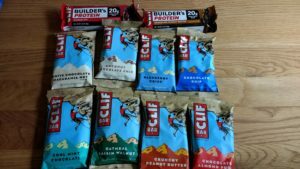 I was contacted to see if I would be able to come along to a breakfast meeting hosted by Clif, with a “build a bar” event. I could not make it, so emailed them back, and they offered to send some bars out to me instead. Andy did comment that the parcel looked like my shopping bag when I have been let loose in a Wholefoods! I was sent a selection of their bars in various flavours including coconut chocolate chip, and cool mint chocolate, and some of the protein Builder’s Bars. 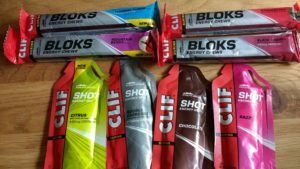 I was also sent some energy gels and chews- this took me back as for my first marathon I loved the clif shot bloks (the berry flavour), and I recently had a couple when I was running the London 10 mile race in Richmond as they had them as the aid stations. The “normal” bars are my kind of thing- I like to put a cereal bar in my bag for “just in case”, or for an afternoon snack if I am going on a run after work (and then after a few weeks I will go through my lunch bag and find many many bars)- they will still be fine after getting squashed and sitting in the warm cupboard at work. The nutty ones are my favourite (and I still wish they would do the pb chocolate chip over here as that is the king of all flavours)- I find the fruity ones a little too sweet somehow. The Builder’s Bars are massive (68g) so I tended to have half at a time. 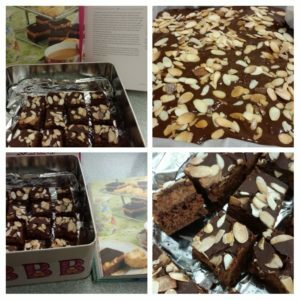 They have a lot of protein (20g per bar) and they are filling. I always get a slight panic when I read the ingredients though- I know they are suitable for vegetarians but I always misread “beet syrup” as “beef syrup”and have to re-read it a few times! They will keep me going for a while anyway. I am saving the chews as I do have a half marathon in November so I can take these with me on my longer runs, and I’ve not had a gel since I tried a few for the Stockholm marathon and didn’t really get on with them, so I can’t decide whether to try them or give them to someone who will definitely like them! How do you know when to run and when to rest? Are you a gel fan? What would be your ultimate flavour combo for a cereal bar? 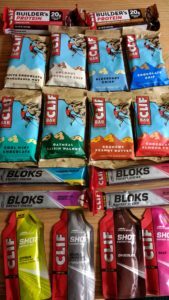 *I was sent the Clif bars but all opinions are my own. 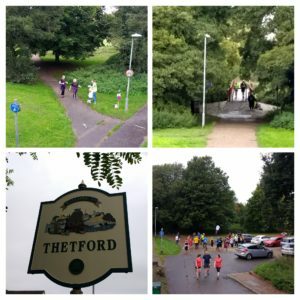 This weekend we had planned a family outing to Hatfield Forest parkrun. 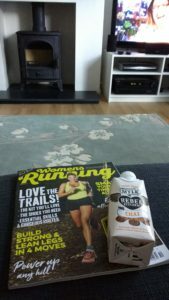 Last year we visited Wimpole Hall, one of the parkruns that take place on National Trust grounds, and had decided that we should try and visit a few more, with Mum in tow, and sample the cafe after to make it a bit more of a morning out. It’s around a 40 minute drive from here, but they close the gates to the car park at 8.40 (the course uses a bit of the road, but as we found out it’s also a bit of a walk from the car park to the start) so Mum and Dad (with my brother in tow) picked me up just before 8am. 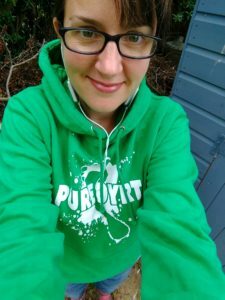 It was so much colder than earlier in the week, so I opted for a t-shirt, a long sleeved running top over the top, and my OH hoodie. I was glad of three layers and could see my breath as I stood outside. We arrived in perfect time (driving past a DFYB sign and commenting that if anyone had forgotten their barcode, it was a bit late for it now), and were welcomed by the car park marshal who asked where we were from and then told us he would see us for the first timer briefing in a bit. They closed the gates shortly after we had parked. There was a huge queue for the parking machine, but as we are all members we initially opted to leave one of the membership cards on the dashboard. Mum then decided she should queue up, and it was ticking closer to 9am she told us to go ahead. We walked through a little wooded area and then around the lake before arriving at the cafe/hut where people were assembling. We hadn’t dawdled but it was gone 8.50 so it turned out we missed the first timers briefing. Never mind- we knew it was a one lap course so it would be a case of following the people in front- no need to count laps. I’d brought a bag so we left out jumpers in it- I kept my long sleeved top on as it was still cold. We kept an eye out for Mum, worried in case she’d got lost, but just as we started Dad noticed her so we could relax. After the main briefing we walked the short distance to the start and headed off. The route was fab. We ran up tracks through rows of trees, over little ditches, through big muddy puddles and there were even some tiny logs to jump over. It was mildly undulating but not really hilly- a few short gentle up and down hills but nothing tough. Although it is called a forest, there were also patches of the run through fields (dodging the mole hills). The little ditches were the most fun but they were hard as you needed momentum to get up the sides without slipping. Dad said he had heavy legs as he had cycled 100km on Friday and I was worn out by a week at work, so we were chatting and not worrying about time (as per usual). The thing about one lap routes is that the km markers seem to appear so quickly – I felt like we had just gone around the first corner when we saw the 1km marker (although my dad never notices them! 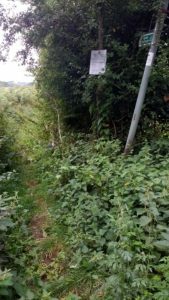 )- at one point we ran through a gate and past the 3km sign, and then had a lovely long downhill. We then ran through the car park and Dad commented that he hadn’t seen any markers and had no idea where we were- as he said it we passed the 4km marker, and the route then went the other way around the lake (if you look on the picture of the route, we would have walked clockwise around the lake to the start). We then had to run uphill slightly towards the finish- my brother (who’d been a little ahead of us most of the way) got more of a lead. We rounded the corner and Dad said “it feels like we are close now as everyone is speeding up around us”- I pointed to the finish area (which he hadn’t noticed) and he broke into a sprint finish. As we finished it turned out that my brother had left his barcode in the car- schoolboy! Dad went with him while I stayed and chatted to Mum. She had acquired a carrier bag full of plants while we were running (she does love a bargain)- she’d wandered to the shop but it was closed, and outside were some plants that had been nibbled by deer, with an honesty box. 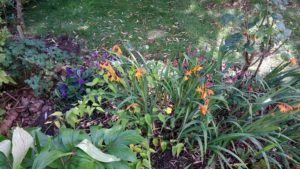 One of the plants had orange flowers and she knew we have been making an orange and purple flower bed so she’d decided to get them for me. 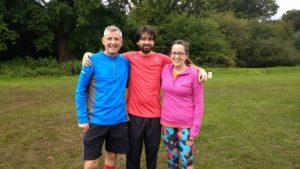 While we were waiting we chatted to a parkrun tourist who I recognised from Heartwood Forest- back from touring in the US (one day…). It took them so long to get to the car and back- we were waiting for about 20 minutes and I was starting to worry that they would start packing up! Luckily they got back before the tail walker, and then we went to find my bag and put on our extra layers- it was pretty cold and damp. Mum had looked at the cafe but it was really a hut with lots of picnic benches outside- this would be lovely in the summer but it was cold and rain was forecast. A quick look on google showed us a Bill’s (my choice) and Wetherspoon’s (everyone else’s choice!) close by in Bishops Stortford, so we walked back to the car and headed there. We didn’t even get back to the car until around 10.10 and then there was quite a bit of traffic in the town. The car park we found was a 5 min walk from Bill’s, so we headed there for hot drinks and pancakes. Even my toe nails were muddy after that run- great fun! 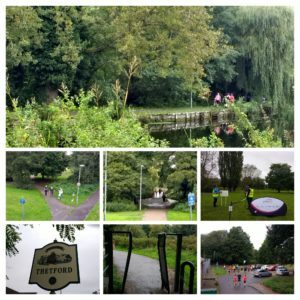 I am so glad that we managed to visit there- the new venue in Castle park will be worth a visit too, but Hatfield Forest was really pretty and I am sure we will head there at some point with our NT memberships for a walk, so even though I won’t parkrun there again, I shall be back. Last Sunday on my run I was attempting to find a bridge over the road (it seems to go into the back of Panshanger park) but the bridle path I took (I thought it was the right one on the map) seemed to finish with a dead end, so I doubled back and went along the path with the stinging nettles so I didn’t do a complete out and back. 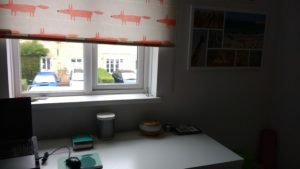 I didn’t want to go far as we had a lot of jobs to be getting on with- curtain shopping for the living room, painting the skirting boards, sorting the garden a bit more and putting up pictures and the clock. 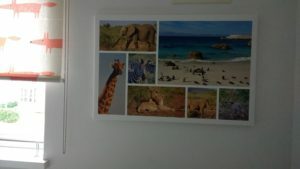 Andy made this for me canvas for my birthday- it’s some of the photos from our trip to South Africa last year, and finally it is up in my office. On Monday I had a massage, and although I thought I wasn’t too bad, it turned out that my right shoulder had all sorts of problems! It was mostly still relaxing, but I did have an apology at the end in case it was too painful at times. My back did feel tender after, but also I could move more easily so it is worth it. It’s been back to work and back into a routine last week. 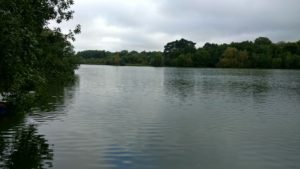 I fancied a run in Panshanger park so I packed my running kit with me and headed there after work on Tuesday. I decided to run the parkrun route but I had forgotten that the bridge near the end was closed due to repairs (they had an alternate ending) so it meant I had to double back to get to the finish. 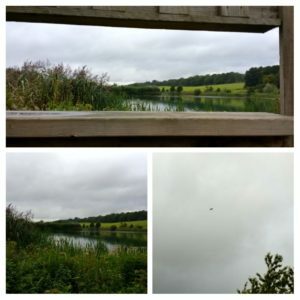 I saw a couple of red kites swirling around the fields at the top, and it all felt very peaceful. On Wednesday yoga was back on- I had missed this so much! I have been doing a few stretches, particularly after long runs, but I have really missed the long classes. It was tough at times (my arm strength takes a dive over the summer) but the final relaxation was of course fantastic and I felt so much better after. 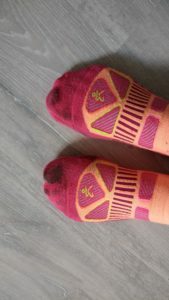 I had a short run after work on Thursday as I felt pretty tired, and on Friday I had a doctors appointment fairly late so I stayed at work until we got kicked out before heading into town (during a crazy thunderstorm with hail stones and flash flooding). After parkrun (and breakfast with my parents) my dad helped me sort of lot of junk from our garden. He’d driven their big car (it’s an old people carrier where you can take the seats out) so that he could do a tip run for us. We still have stuff left by the previous owners- to be fair the house was clean and empty but they’d left a load of junk in the shed, and when we had to take the shed apart (as the roof didn’t meet in the middle) we’d just left it all in a corner of the garden. They also had used large chunks of concrete to edge some of the flower beds. 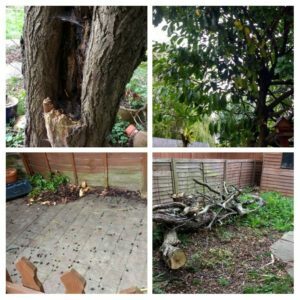 Our garden waste bin is only emptied once a fortnight so the tree that was rotten hasn’t even gone yet, so we spent a good hour “strength training”- basically lifting chunks of concrete, old tins of paint, bits of wood and lumps of tree into the back of their car. We also had a box of things for a charity shop which we sorted out before we moved (May 2016! ), and as my mum volunteers in a charity shop she took it away to give to them. It was all very therapeutic. After they left I had a quick shower and then made some cookies (as some of Andy’s family were coming over later). I needed to walk into town to buy dinner and it ended up being a race against the clock and the huge clouds! I got home just before it poured (and just before my guests arrived) and we had a lovely few hours catching up. I then made a sort of caramel slice (it’s a bit like a brownie base, with caramel and then topped with chocolate- it’s meant to be with hazelnuts but I had none so I used almonds)- this was originally going to be for tea on Sunday but our plans changed so it went into work this week. I felt like I had barely sat down, so while I was waiting for Andy to get back (he’d been down in Southampton for the day) I watched a bit of the Bake Off Extra Slice and had a lovely chai drink. 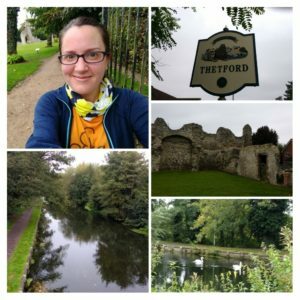 On Sunday I decided to go for a bit of a shorter faster run, so I found a 6 mile route and managed to keep the speed up keeping the pace just under 10 minute miles as recently I have been going on lovely runs, but I’ve been going much more slowly. When I got home we had breakfast together (we’d bought cinnamon rolls for the freezer so we had one of those plus some watermelon) before Andy was off out. I had some work to do and fancied watching the Great North Run so I brought my laptop downstairs and spent a couple of hours finishing things off while watching Mo win, before I felt I really needed to move. After doing so much sorting in the garden on Saturday, I decided to head outside and get on with some more gardening. There’s a tree (laurel?) and it drops berries all over the patio- while Dad had been loading the car up I’d swept them all into a pile but of course with the slightest wind another lot of them falls down. If they were on grass it wouldn’t be so bad but I don’t want to tread on them and then get the red juice on the carpet inside or anything. 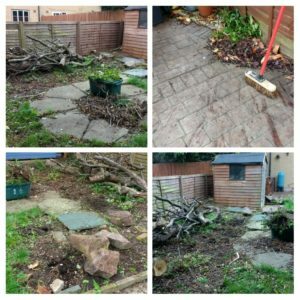 There is also a big patch of weeds where we need to plant a fruit tree (one of the conditions of taking the massive ugly tree down) so I decided to attack that and do some sweeping as a break. Clockwise from top- our rotten willow, the dreaded berries, before any weeding, berries on the floor. And after- the weed patch mostly empty and the berries all swept up again. It was very satisfying work and I listened to a bit more of the Marathon Talk podcast while I was out there. Some of the weeds were actually little bushes and the root balls were huge (the size of those rocks)- I think I spent about 20 minutes on one of them going around and around, gradually easing it out more. Andy got back from the cinema and offered a cup of tea, and I was going to attempt a couple more of the root balls but then it started to rain harder so I decided to call it a day. My arms and back were aching after all the digging- another strength workout? Did you watch any of the GNR? Do you like gardening?